Ominous bass line, blaring trumpets, a sinister piano twinkle -- that's what our nation's capital sounds like to composer Jeff Beal. That's the main title music for the Netflix original series "House of Cards," starring Kevin Spacey. And while fans of the series eagerly await Season Five, more of the show's distinctive music is coming to South Florida. The University of Miami's Frost School of Music series "Festival Miami" kicks off Thursday at the Adrienne Arsht Center with "House of Cards In Concert." 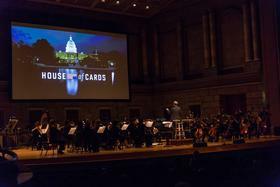 The live-to-screen multimedia event will be conducted by the show's Emmy Award-winning composer, Jeff Beal. In the interview below, Beal talks with WLRN's Christine DiMattei about his inspiration for the "House of Cards" score, the various challenges in writing dramatic versus documentary scores and how an ongoing battle with multiple sclerosis has affected his approach to performing. WLRN's Christine DiMattei interviews Emmy Award-winning composer Jeff Beal.